There is nothing more appealing to me personally than waking up early on a cold Winter’s morning with the mist still hovering above the Sand River and the golden and pink sun breaking the morning chill. The morning chorus has begun and a feeling of excitement and adventure is oozing out of each guest on the vehicle. On a recent morning, this was the feeling myself and my colleague Life Sibuyi had when we decided to cross the river onto the northern section of Londolozi known as Marthly. The North has become a hot topic of discussion, on the blog as well as around the fire and in the ranger’s room. It always seems to deliver when it is most needed and without prior warning. This was exactly what happened on one of my most cherished mornings since joining the Londolozi team. The click of the fingers and a raised hand from a tracker often suggests tracks on the road or an alarm call somewhere in the vicinity. Life jumped off the tracker’s seat to inspect the tracks, suggesting they were from a male leopard and were fresh. “Around sunrise.” I recall him saying. We both took a quick walk to determine a direction, and from this we knew we were onto something. Suddenly in the distance the alarm call of an impala then a growl and a shriek! Back onto the vehicle as quickly as we could, we raced further north in the direction of the action. We came up to the crest of an open area, the Ximpalapala crest, stopped to listen for any further alarms or noise and there in the distance we spotted a male leopard standing on a termite mound, focused, alert and as inquisitive as we were at the sound coming from a nearby thicket. Was this not the male that was involved in the previous events of alarms and growls? It seemed not. Yet we were all intrigued to see how this would pan out and we spent time with this male, and watch his behavior as his opportunism got the better of him. 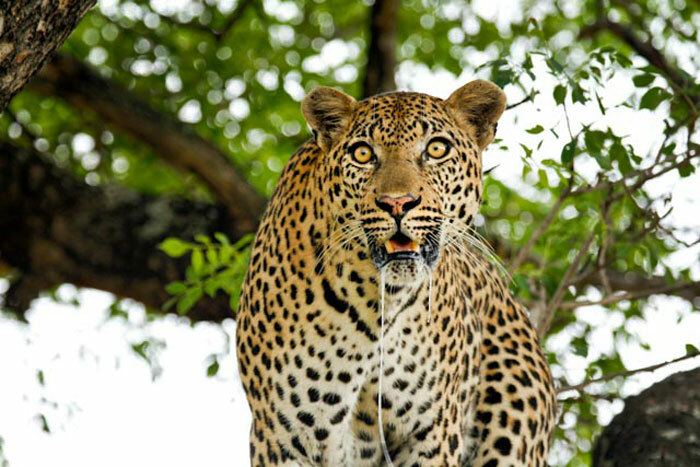 Leopards will climb trees for many reasons, mainly to evade other approaching threats like Lions or Hyena, however a Leopard will also take advantage of higher ground to gain a vantage point and to survey the surroundings. 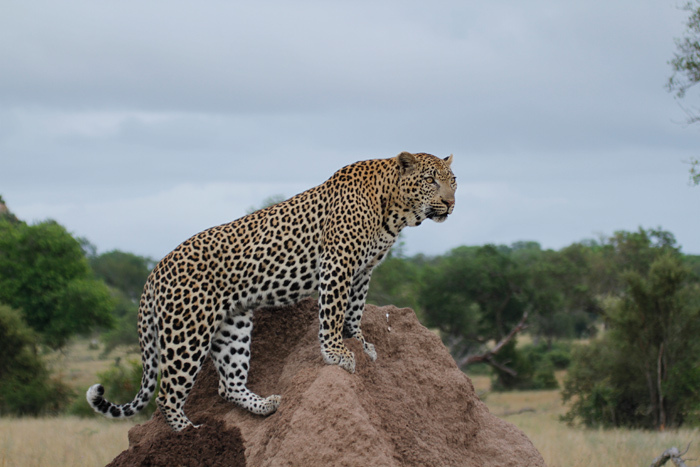 This was the case when the leopard we had found was first seen on the termite mound. 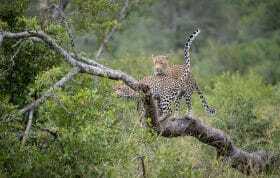 He then climbed an enormous Marula tree and sniffed around for the presence of other Leopards in the area. 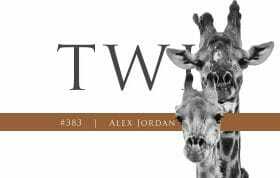 By now we had come to the conclusion that this particular male, the Gowrie 2:2 Male, was completely out of his comfort zone and in the heart of the territory of another well known male, the Marthly Male. The Gowrie Male spent some time in the tree sniffing about for obvious signs of the ever-present Marthly male, who would most definitely have occupied that same tree in the recent days. His scent was all over the tree and we could see this in the behavior of the Gowrie Male; now in another male’s territory, but young and strong and most definitely looking to extend his range. Could there be a battle for land unfolding in front of us? We were eager to witness the developments and so we followed. Agile and strong the Gowrie male climbed down the tree toward a thicket. 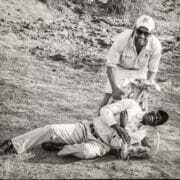 At this stage we were unaware of what lay in that particular thicket; was it another male Leopard, Hyena or Lions? With baited breath we edged forward, as did the Gowrie Male. Tensions rose and then an explosion from the long grass, growling and squealing. Panic running through the bush and through the vehicle! What we had discovered were 3 Hyenas feeding on a fresh impala kill, which they must have robbed from another predator, possibly the Marthly Male. The Gowrie male had heard the pandemonium and made his way in to investigate. Before we knew it he was back up a large Jackalberry tree with Hyenas circling at the base. By now the intensity on the vehicle was at an all time high and we waiting on the edge of our seats to see what would happen. The interaction between the leopard and the hyenas continued for over 40 minutes without any success on the Leopards behalf. We watched him being chased in and around our vehicle until eventually the Hyenas decided that in order to keep this stolen kill safe they needed to move it away from its original position. 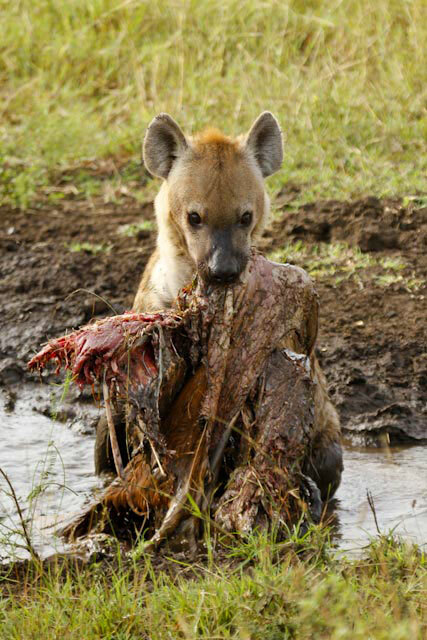 While a leopard will feed on the carcass of an adult impala ram for up to 3 days, a single hyena can devour half the same carcass in under 20mins! 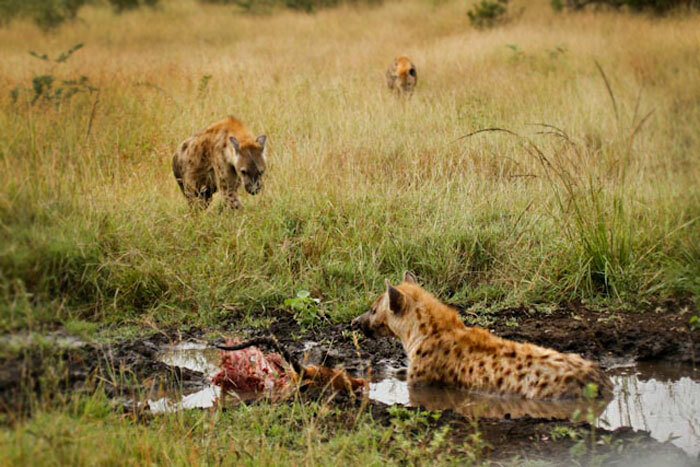 A hyena lies in a small pan with the remains of the impala while it’s clan-mates move in. 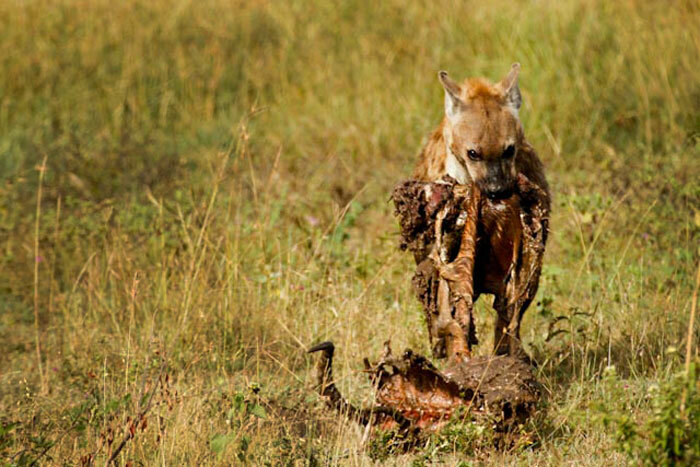 One of the larger female Hyenas carried the kill to a nearby pan where she rested shortly as the other Hyena kept the lurking Leopard at bay, until they too decided that it was time to escape with their bounty. The small clan met at the waterhole for a few short moments and a quick drink and swim to cool their now overheating bodies down. But opportunism kept the male Leopard in the area, following at a safe distance to take his chance as soon as the clan dropped their guard. The carcass may look broken-up, but it probably weighs in excess of 30kg. 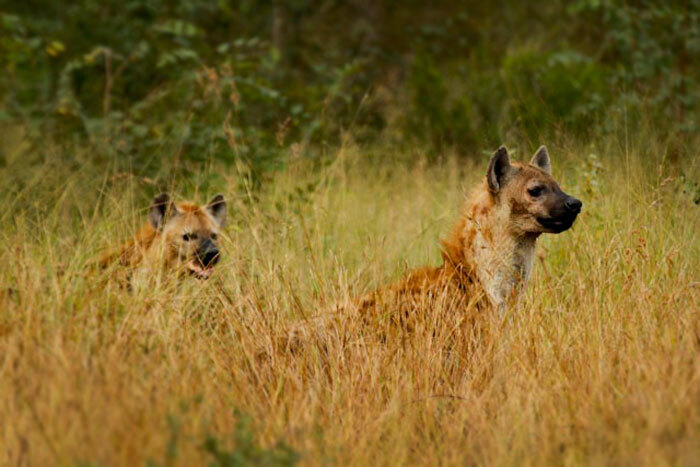 For the immensely powerful jaws of a spotted hyena, however, this is hardly a challenge. We waited at the pan until eventually the Hyenas moved off, possibly carrying the impala kill to a nearby den site, and the Leopard was hot on their heels. We watched in awe as he tracked the scent of the carcass, had a quick drink of water in the same pan and as he moved off we decided to allow nature to take its course in private. The gowrie male’s characteristic staring eyes focus on the thicket in which the hyenas were feeding on the carcass. As the exhausted Hyena clan, dragging the carcass, Leopard in tow, disappeared into the thickets West of Ximpalapala koppie, I looked back at my guests and then to Life. Wide-eyed and lost for words with the knowledge that the event we had just had the privilege to be a part of was not your everyday sighting. A highlight of my past few months at Londolozi. Shortly after this we decided to take a break ourselves and enjoy a cup of coffee away from the action and give ourselves time to reflect and discuss the past 2 hours in this land of beauty. Nice one! Awesome shot of the gowrie male with saliva hanging! Awesome sighting Mike and really great shots. 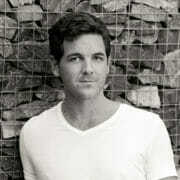 Looking forward to seeing more of your work on the blog. Nice work Suthers! Also love the shot with the saliva hanging down. Suthy! Awesome awesome stuff boet! Great shots and superbly written!